It helps in confirming formal heartbeat. It tells about the progress of the pregnancy. It checks the status of the umbilical cord. It also checks the status of the placenta. As placenta supplies all the nutrients to the baby. It tells the position of the baby in the womb. And looking after the position doctor can determine the delivery date. It determines the health of the mother.Also any issues or complications like clots or cysts in the mother that can cause problems before or during labour. It can tell the general development of the baby in terms of length and weight. Mother is suffering from diabetes or high bold pressure. This can cause issues in blood flow to the baby. Mother is carrying twins or more. Mother is smoker. Smoking causes blood flow slow to the thinning of blood vessels due to Nicotine. Also apart from the carbon monoxide present in the cigarette, smoke impairs the ability of blood cells to carry oxygen. Mother has suffered a miscarriage before. High or low BMI as the time of conception. It helps in identifying pregnancy problems non-invasively. 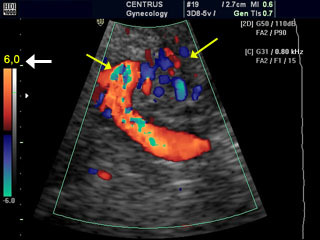 It is more reliable than traditional ultrasound procedure. The f an unborn baby can be heard in the early stage around 12 weeks pregnant. Doctors observe and monitor foetal development much earlier than other technologies. This test can also be conducted if pregnant women suspect that their baby’s heart has begun beating earliest by the 5th week of pregnancy.